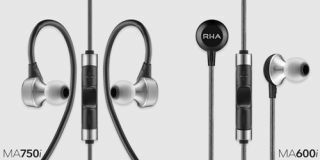 RHA launches MA750i and MA600i premium in-ear headphones | What Hi-Fi? British headphone maker RHA has announced two new (relatively) premium additions to its in-ear headphone range, the MA750i and the MA600i. Claiming to offer an open, natural sound, the MA750i earphones features handmade dynamic drivers to deliver "precise and articulate audio reproduction". The new headphones sit above existing budget models from the British company, such as the £15 RHA MA150 headphones and the five-star RHA MA350. Designed to be both durable and comfortable, the in-ear headphones have an over-ear cable support and is the first RHA product to make use of stainless steel construction. Not to be left behind in the construction stakes, the MA600i is made out of aircraft-grade aluminium. Tough, but light. Both headphones come packed with a selection of RHA's memory foam tips for a more comfortable fit and, RHA claims, more effective noise isolation. The MA750i and MA600i headphones have been designed with Apple products in mind, with a three-button remote/microphone design available to iPhone users. Remote playback should work with most other devices using a standard headphone connection (so Android users aren't left out in the cold). Nonetheless a remote and microphone-less version (MA750/MA600) will be available in September. We find models without in-line mics do often sound a touch better. The RHA MA750i and MA600i headphones are available to purchase now at £90 and £60 respectively. Look for them in Apple retail stores throughout the UK and Europe.